The Aventador S 740hp is truly in a league of its own when it comes to looks, performance, and sound. 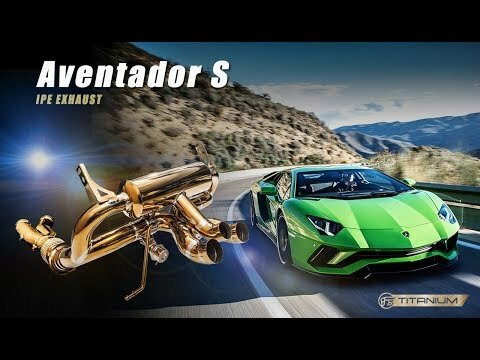 With our new titanium exhaust, performance and sound can be even further improved. The iPE titanium exhaust systems comes with cat-bypass pipes wrapped in heat protectors and our trademark Valvetronic muffler with tips. With minimum weight and maximum sound, an unforgettable racing experience is guaranteed. The exhaust is designed with passion to the smallest details, in order to product the state-of-the-art F1 exhaust iPE is famous for. The remote control makes it possible to switch between open, closed, and auto mode, by the push of a button. Being able to control the exhaust valves manually and automatically opens up whole new dimensions when it comes to fun behind the steering wheel. *Golden System are available only on "PREORDER"